It's not uncommon for parents to bring their infant with a feeding problem to an emergency department. Although that might seem like a problem best managed by a GP or other primary care clinician, it is also understandable that parents seek answers wherever they can find them when their baby seems to be constantly miserable. The natural tendency of many infant presentations to self-resolve (colic, mild reflux etc.) means that rather than always medicalise the situation, watchful waiting is often the best strategy. If the problem is non-IgE cow's milk protein allergy (CMPA) then delay in intervention leads to prolonging the infant's misery. Getting the balance between overdiagnosing CMPA and avoiding a delay in diagnosis is not easy. It involves careful history taking and thorough examination alongside a sympathetic but objective approach. During this process, it is common for parents to feel that they are not being taken seriously or that no-one is doing anything. The reality is almost certainly that they are being taken seriously and that a lot of work is being put in by the clinician seeing them. However, it can be that the parent feels that they are no further forward and so come to the Emergency Department (ED) to seek what they percieve to be a more specialist opinion. If an infant genuinely does have non-IgE CMPA, that diagnosis will rarely be made at first presentation because the symptoms are too vague and non-specific. Gastro-oesophageal reflux disease (GORD) is more common and in many cases this is the presumed diagnosis for the miserable infant regurgitating some of their feeds. The diagnosis of CMPA is often not made until the third or fourth attendance. This is entirely reasonable since it takes time to establish a pattern of symptoms and to consider other possible diagnoses. Let's imagine that the third or fourth time that the parents of a formula fed infant seek help is the time they go to the ED. They are seen by one of the doctors and that person thinks that on balance, management as possible CMPA is the logical next step. What should that clinician do - change the milk or send them back to their General Practitioner? This question of who should do what is an interesting one that causes much debate. There are plenty of arguments for the ED clinician to make the change. The ED clinician has decided that they think it is the right thing to do. There is an ethical mandate to either do it or facilitate the change in milk. Sending the parents away without making the change themselves poses a risk. Changing the milk avoids some duplication of work for the GP. There is no guarantee that the parents will be able to get an early appointment with their GP and any delay might mean unnecessary suffering for infant and parents. Assuming there has been some continuity at the GP end, the GP will have a better idea of the full picture rather than just the one presentation to the ED. 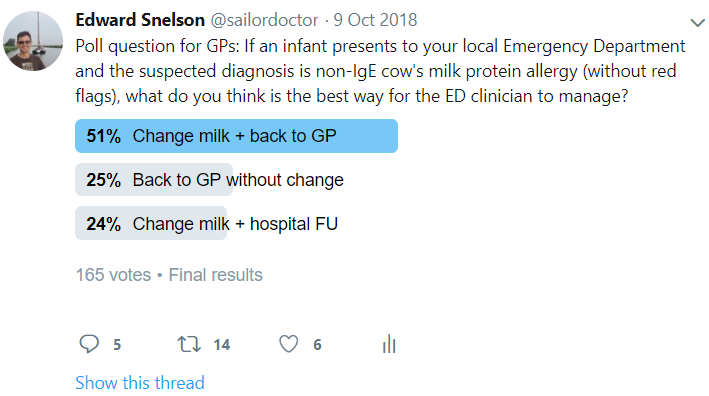 By changing the milk, there is potential to undermine the GP ("My GP did nothing but the hospital diagnosed and treated...") and reinforce the belief that the ED is the place to go for everything. There is a possibility that by doing so, the GP's equally valid but slightly different plan is derailed. Once the change is made, it is extremely difficult to undo that change. We want the infant to have the right treatment in a timely way but we also know that it is in everyone's interest that we don't end up undermining the relationship between that family and their GP. Another factor that affects the decision is the uncertainty that is brought about by the primary-secondary care divide. Each group will tend to have its own opinion about the best way forward. Due to a woeful lack of converstaion between primary and secondary care, there are often assumptions made rather than actual converstions about such matters. In the digital age, there is no real excuse for a lack of discussion about these things so I decided to ask both sides what they thought. First of all I asked the primary care community what they thought should happen. Three quarters thought that the ED clinician should change the milk. About a quarter thought that the child should then stay under secondary care. Another quarter wanted to retain control of the decision making in primary care. Next I asked the EM community what they thought they should be doing. The results were remarkably similar. I found that very interesting. While there was no overwhelming consensus on the best action in these cases, there was good agreement and certainly nothing that could be described as opposite views. 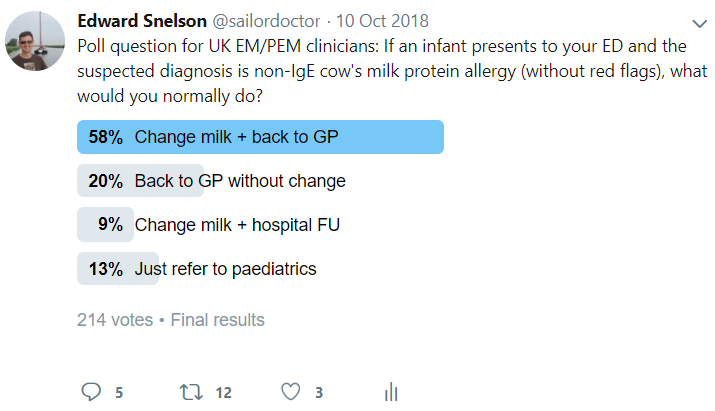 As well as suggesting that changing the formula and returning the child to the care of their GP is likely to be the most acceptable way forward, it shows that there may be times when the assumption that the two communities will have very different views will be wrong. There are many percieved differences between the views of primary and secondary care clinicians. If we go about it the right way, we might be able to explore those perceptions in a functional and constructive way. We might better understand the differences in approach if they do exist and learn from each other. We might, as in this case, find out that the imagined differences are not all that real. Of course, done badly, it will end up with upset and opposition. Let's not do that - we're all on the same team. Whatever we do, we should come at these discussions with positivity and an open mind. In the era we are in, there is no good reason to allow percieved differences to remain unchallenged or unresolved. Thanks to everyone who took part in both polls. If you have any other suggestions for similar issue that could be explored, let me know (post in comments below or contact me via social media). We should definitely talk more often. If anyone is wanting to get involved in the conversations on Twitter but feels cautious about it, there was a great guide written recently by the Don't Forget the Bubbles team which would be useful for anyone who would apprectiate a little guidance in what to do when starting up on Twitter. Leo, G. Don’t Forget The Twitter, Don't Forget the Bubbles, 2019. As a GP who also does 1 shift per week in ED (and mother to a very poorly managed cmpa/severe reflux/FTT child a few years ago (now ok aged 7 but lasting psychological issues), I would propose another option: pick up phone and speak to duty GP (if in work hours). This improves communication, saves time, and shows the family we ALL are interested and are ALL working together towards a solution.